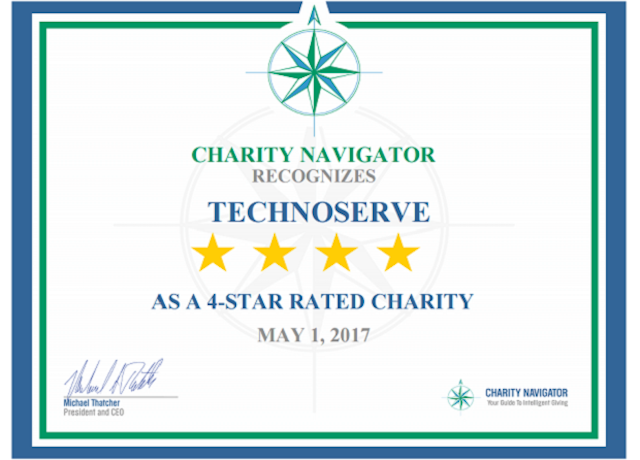 For the eleventh consecutive year, Charity Navigator has awarded TechnoServe their highest rating of four stars. TechnoServe is recognized by multiple independent evaluators for our commitment to transparency and conduct. Charity Navigator is a leading evaluator of charitable organizations that reviews thousands of charities each year. This year Charity Navigator reviewed over 8,000 charities and awarded TechnoServe 4 stars for the 11th consecutive year, placing us in the top 1 percent of all charities reviewed. Charity Navigator rates charities based on financial health, accountability, transparency and results reporting. To determine these ratings, Charity Navigator evaluates financial records, information provided on websites, governance and ethics practices, information access for donors, and how an organization reports results. CharityWatch is another evaluator that focuses on nonprofit transparency, specifically on how efficiently an organization uses donations to fund its programs. Letter grade ratings are determined based on two factors: the percent of total expenses that a charity spends on its programs and the cost for the charity to acquire $100 of cash donations from the public. TechnoServe's "A" rating for financial efficiency indicates that we maximize the impact from every dollar and fundraise efficiently. GuideStar gathers information about nonprofit organizations and makes it more accessible for the public in an effort to encourage informed and confident charitable giving. TechnoServe has been recognized as a Platinum-level participant, indicating that we rigorously report our progress against our mission in quantitative terms, going beyond surface-level financial reporting. Our donors make our work possible. Consider making a donation to TechnoServe today to help us continue supporting enterprising men and women around the world.